If you have any questions feel free to email: meredithlingberg@juno.com . Dec 4 at 7:05 PM I am offering today a One owner FULLY LOADED, With a Clean Car Fax. 2014 Toyota Sienna Limited All Wheel Drive in excellent condition. Has just 22, 722 just serviced miles and is ready for it's next owner. The Sienna's exterior is pre dawn gray with a light gray interior. 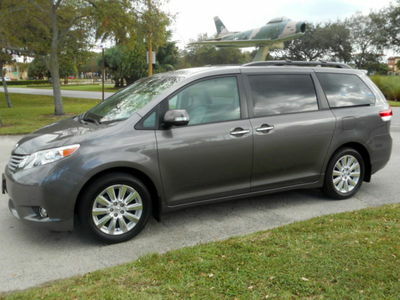 This Sienna is a highly equipped vehicle with the Limited Premium Package of $4, 105 which Includes: Entertainment Center with two wireless headphones Voice activated touch screen DVD Navigation System with Panorama Camera including integrating backup camera with two views regular mode and wide angle with on screen backup guides. JBL AM/FM/MPS 3 stereo system, 4-disc CD changer, 10 speakers, Sirius XM radio with nav-traffic, USB port with i-Pod, blue tooth wireless technology, roof rack cross bars, wheel locks. full leather interior and all the amenities you would expect from a vehicle of this class. The Sienna comes with a three year bumper to bumper warrantee and for this vehicle it expires on 5/28/17...still plenty of miles and time left for your peace of mind. The Sienna appeals to a wide range of families looking for roomy, comfortable and higher quality transportation. With the 296-HP 3.5 Liter V-6 paired to a six speed automatic transmission that drives the front wheel and if necessary converts to a an all wheel drive a real bonus when the weather gets nasty. This plus the blue ray entertainment display keeps the kids busy and not distracting the driver.